Once upon a time, it seems Peanuts creator Charles Schulz (edit: maybe) and Marvel cartoonist John Romita, Sr. drew a pair of collaborative comic strips featuring the Peanuts cast and Spider-Man. 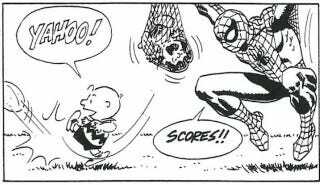 In one, Spidey faces off against Snoopy's WWI ace; in the other, he helps Charlie Brown finally kick that football. This epic crossover appears in the book The Romita Legacy, but no one seems to know anything more about the story behind it. Now all we need is a Peanuts/DC crossover where Lucy offers her psychiatric services at Arkham Asylum. Edit: Several commenters are noting that the line work doesn't quite look like Schulz's, and that this was probably the work of Romita alone. Even it's not actually a collaboration, it's a fun pair of pieces.